Deck footings, part 3 (of 7) of the 10x10 how to build a deck tutorial, provide the foundation for the vertical posts that support a deck. The size and depth of deck footings vary depending on your location, soil composition, and the amount of weight the footing will be required to carry. 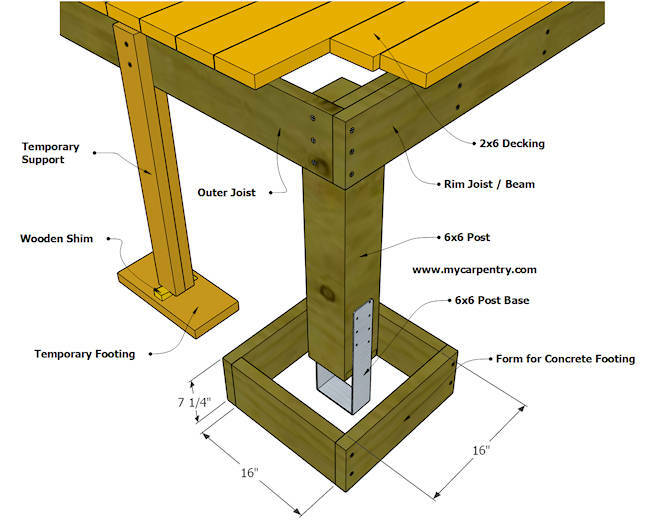 The Prescriptive Residential Wood Deck Construction Guide, by the American Wood Council (AWC) (link at the bottom of the page) contains a table that explains the sizes of footings based on Beam Span, Joist Span, and Live and Dead loads. Using our 10x10 deck example, the footing size is 16"x16" (406 x 406 mm) with a depth of 7" (178 mm). Building code suggests that all footings should bear at least 12" (305 mm) below undisturbed earth or below the location's frost line, whichever is deeper. It is recommended that you contact authorities to determine the frost line and footing requirements in your area. Depending on the situation, they may wish to do an onsite investigation of the soil conditions before you build. You can build a simple form out of 2x material to support the freshly poured concrete until it sets up (as in the diagram below). Alternatively, you can use the ground itself as a form for your concrete footing. Once you have determined the depth of the concrete form, and have built or dug the necessary footing below the location of the 6x6 post, the next step is to determine the length of the 6x6 post. Using the 10x10 deck example, use a tape measure to measure the distance from the bottom of the footing to the underside of the deck framing. Subtract 7" from that number and cut/notch the post so that, when attached, it will float 7" from the bottom of the concrete form. 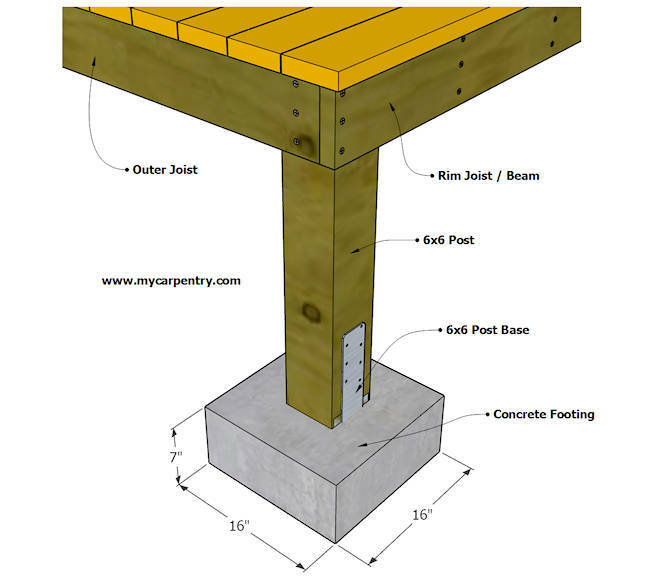 Attach a galvanized Post Base at the bottom of the post so that when the concrete is poured, it will form around the Post Base and secure the 6x6 post in place. Before pouring the concrete footing, double-check the deck to make sure it is still level and square. Finally, pour the concrete up to the bottom of the Post Base. Let the concrete harden for about 24 hours. Remove any wooden forms and the temporary supports used to prop up the deck.